I’ve got a Spector Legend Classic 4-string bass (Black Cherry), Korean. I just had it setup at Five Star Guitars and this thing is awesome. EMG’s, 2 Humbuckers, 2-band active eq, nice looking quilt maple laminate top, and this thing is super versatile. Very nice Bass this is an older version, they just stopped production of this bass last year nice cured ergonomic shape classic spector NS body theP/J pick up combo has a wealth of sound possability and the bass has a very nice woody tone. 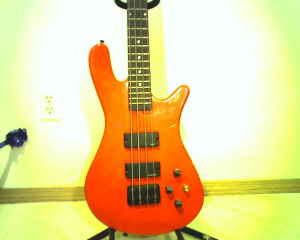 this bass retailed for over 800.00 when it was still available.